There is a statement that “You can never go home again.” The owners of Tillinghast Manor would disagree. No matter where you are from, when you spend a few relaxing days in the Finger Lakes you feel like you are home. Prior to retirement, Jean O’Donnell-Smith, Manor Manager, traveled extensively staying in Airbnbs, hotels and Bed & Breakfasts. Business travelers are up and out early focused on the day’s agenda. The manor is about the business of your vacation. We are conveniently nestled between the Cayuga Lake and Seneca Lake Wine Trails. The idea of a “Wine Down” experience is so very important when you are on vacation. When you walk through the doors of Tillinghast Manor, the goal is to leave your cares behind and “chill”. 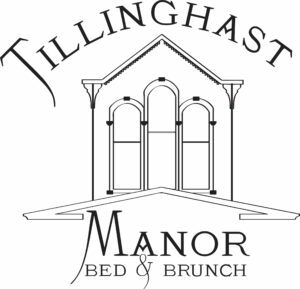 Tillinghast Manor is not a Bed and Breakfast. It is a Bed and Brunch, a unique concept. Many BNBs serve during a regimented time to allow for quick turnover of rooms. Our philosophy is when you are on vacation, sleeping in is a much-needed pleasure. To accommodate late risers, we will serve Brunch with late check-out. We are staunch supporters of our Ovid community businesses. So, if you are an early riser and love to hear the birds sing and watch the sunrise, we will provide you with coupons for local coffee shops and diners. Most of which are in easy walking distance from the Manor. Mike Smith, the Inn Keeper, hails from Southern California. He is laid back a la Jimmy Buffet. Mike has been working tirelessly to update the infrastructure of the Manor. As a talented Cabinet Maker, he has embraced the challenge of an 1870s Italianate. Air conditioning is not as glamourous as the attention to refurbishing the beautiful doors and staircases. A new chef’s kitchen has replaced the two small ones that Blanche used in the 1990s. A remodeled dining room can now accommodate 6 or larger dinner parties. Mike has been and will continue to work tirelessly to insure your stay is comfortable. He is a true Renaissance Man with a wide expanse of interests. From fossil collecting, diving, to kayaking, fishing, and imbibing he is your guy. 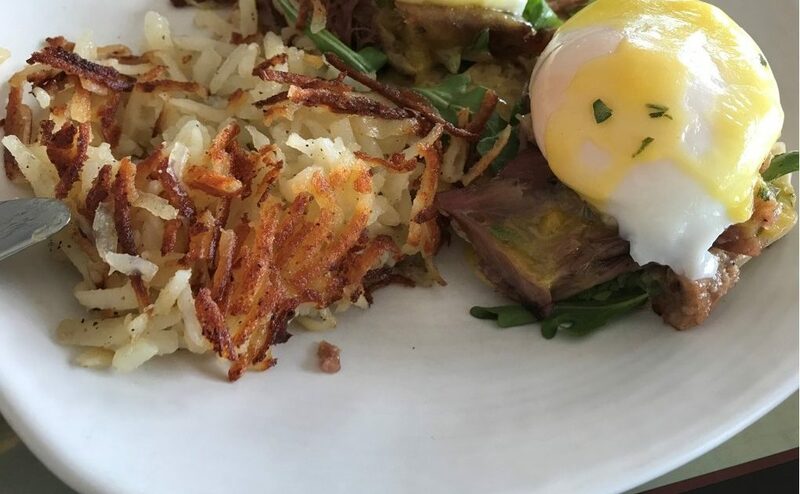 He is perfecting his French Omelets, Eggs Benedict and other tasting treats. Check out our Facebook page to see all his yummy creations. When your day is done, we invite you to sit out on the patio and make smores. You can enjoy a game of horseshoes or corn hoe. We are keeping a tally of winners and whoever finishes at the top of the leaderboard will be rewarded! 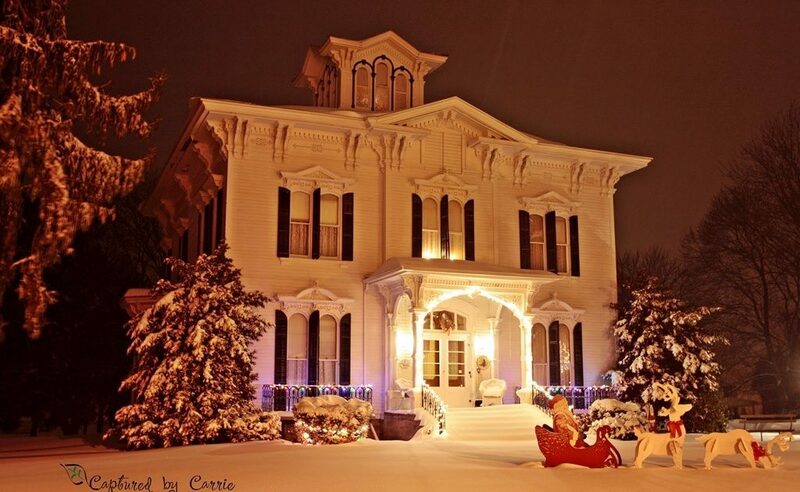 In Seneca County, many of the Italianate homes that were erected in the 1870’s are in ruins. Fortunately for you, the former home of George and Hannah Jones has survived. We invite you to come stay with us and enjoy the pleasures of this grand manor with its cupola. George was very civic minded. He was the treasurer of Ovid Village, a member of the Board of Trustees of the Willard Asylum and ran for New York State Assembly on the Republican ticket. The Manor was completed in 1873 with lumber that was milled at the Ovid Steam Mill where George was proprietor. It is amazing to think that the home was built for about $12,000. The Maple, Chestnut and Hickory was hand selected for the casements and the grand staircase. The (remove pine)plank flooring in the Grand Parlor and dining room have been faithfully restored. The five slate and marble fireplaces remain as they did when the Jones family entertained guest. One such guest was a young statesman making his way home to New York City, Theodore Roosevelt. Elected as a Republican to the New York State Assembly in 1881, at 23 he was the youngest member of that body. He served 3 terms and was minority leader in 1883. It has been lost to history exactly the purpose of the visit or the discussion. One can surmise that Teddy encouraged George to throw his hat in the ring for assemblyman. In 1884, George Jones was elected to the seat on the Republican ticket, leading his party by 600 votes. George remained in Ovid and we all know the career path that young Teddy took. He became 33rd Governor of New York in 1899 and in 1901 the 26 th President of the United States.. The home was purchased by Blanche and Donald Tillinghast and converted into a Bed & Breakfast in 1992. The Manor has become a well-loved structure in Ovid and their name remains. We invite you to stroll the Main Street and enjoy The Three Bears.These are not Teddy Bears but 1845 intact Greek Revival buildings. Sit awhile in our local brewery, diner or coffee shop and un- wine watching the Amish Buggies clatter past. If you close your eyes, you will think you have been transported back to the day when Hannah Jones greeted guests and women could not vote.